This time last week, I was just getting home from running my first marathon. My stomach was yelling at me and I was replaying the whole morning in my head, with a smile on my face. Now, my legs are no longer sore (but my ITB decided to act up…trying to tell myself it’s fine, the marathon’s over and I’m allowed to rest! ), and the high I got from the race has lost its initial intensity. I wanted to write more about the race and what it means in the context of my life as a runner, both past, present, and future. May 2011. 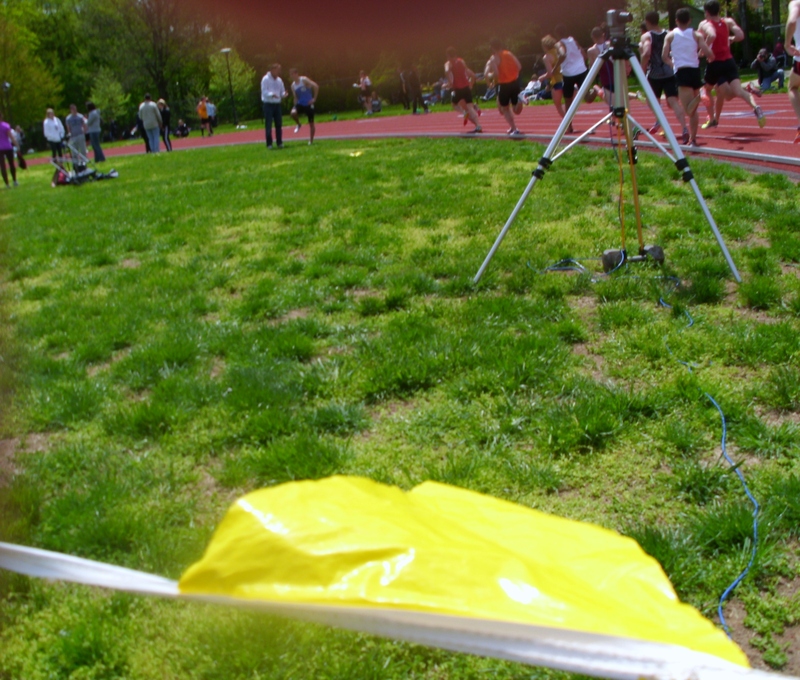 My view, pretty much every meet in college. Expert lap-counter. 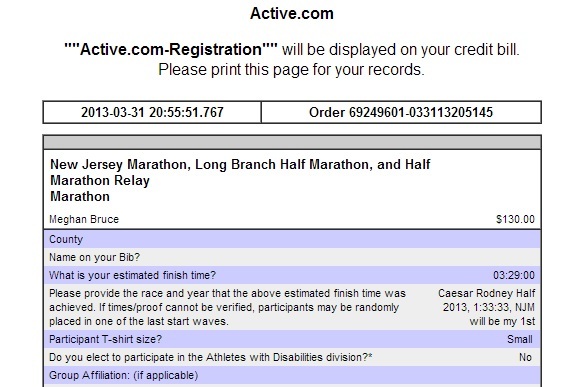 If you asked anyone this day last year (when I was celebrating my college graduation with a gift to myself: a brewfest ticket…) if I would run a marathon less than a year later, feel awesome, and qualify for Boston, probably 90% of people I knew would have said no. Not because of willpower, dedication, or talent, but because of luck, or lack thereof. 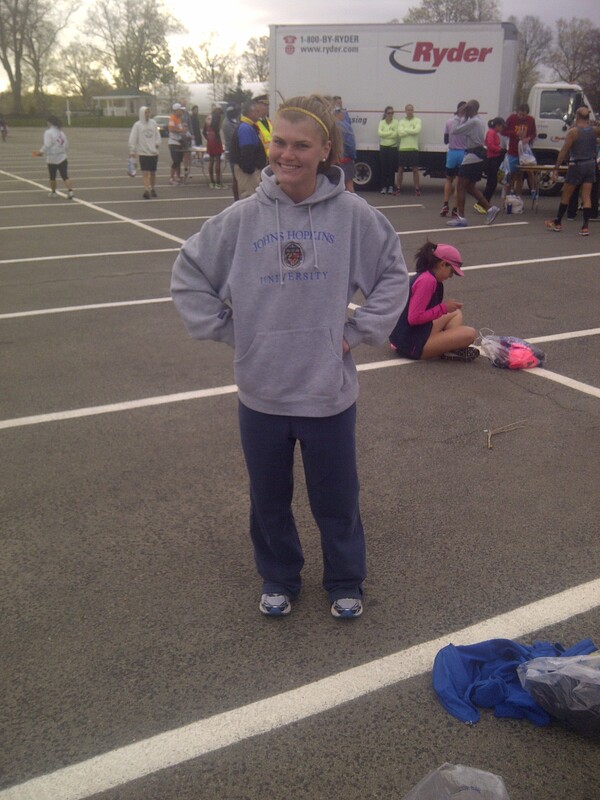 If you’ve read my running story, you know I was not the typical college athlete. There was no guarantee I would start or finish any given season. I tried as hard as I could to prevent getting hurt and every single time I failed, for reasons neither I nor anyone else could figure out. Every spring, after Fridays spent in class, then in the pool sweating out some boring “miles,” the training room, and then the library late into the night, I would pack a bag and head to my car, off to watch my team compete at track meets. I would try to nurse whatever injury I was dealing with at the time on the way, leaving old plastic bags once full of ice all over the floor of the car, Ibuprofen stowed somewhere in case it felt worse from being on my feet at the meet. I would stand on the side, losing my voice cheering for my friends, filling up my watch with split times and my camera with hundreds of race pictures. I would smile and celebrate when the team did well, which was often. I would head back to my car and make the trek back to campus, and each time among the excited thoughts about how everyone ran, there would be a resounding voice that said, why not me? Someday I want to accomplish something like this and not be happy just because everyone else did. This would happen every single weekend, and I would feel further and further away from ever obtaining that feeling. I remember watching my best friend run a provisional time for the 10k on Princeton’s track past 10:00 at night, in the freezing cold, and then breaking down once I was in my car, having no one to talk to about the feeling since it was a strange one: I was excited for him and everyone else, I wasn’t exactly jealous, or selfish, or hopeless. It was hard to understand, and equally hard to deal with. March 2010. 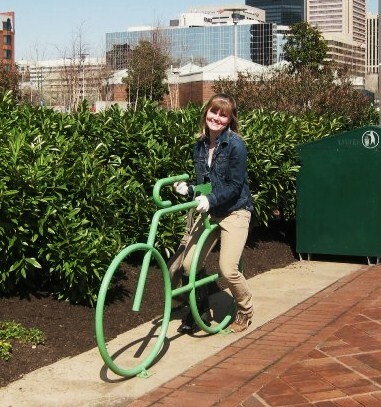 Not a real bike, but it could have been. Note boot on right side. 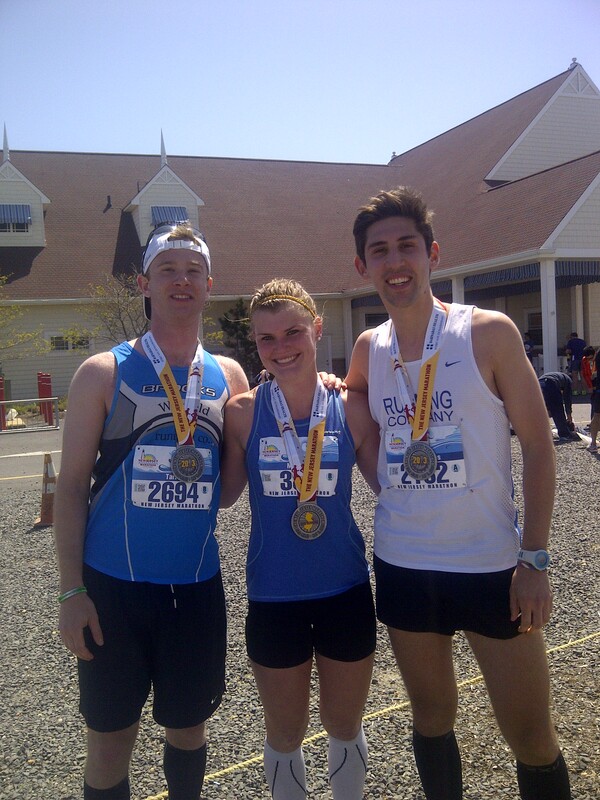 The first weekend of May has always been a big one for me as a runner. It is the weekend of my college conference championship meet, as well as my friend’s, which I would often travel to Pennsylvania to watch also. I would drive all over, often with the contents of my dorm in the car, watching all these exciting races happen, and come to terms with the fact that yet another year had gone by and I hadn’t had a chance to do what I wanted to do, with running. I hadn’t had a chance to score points in the 5k, or ride the van back to school after a big win with the team. And I didn’t know why it kept happening. Freshman year, I ran the meet injured and it was quite disastrous. Sophomore year I was injured and was assigned about a dozen duties working the meet because it was at home. Junior year, I drove a couple hours north to watch the meet, injured again. I went right to visit a friend after in some attempt to not let it get to me. 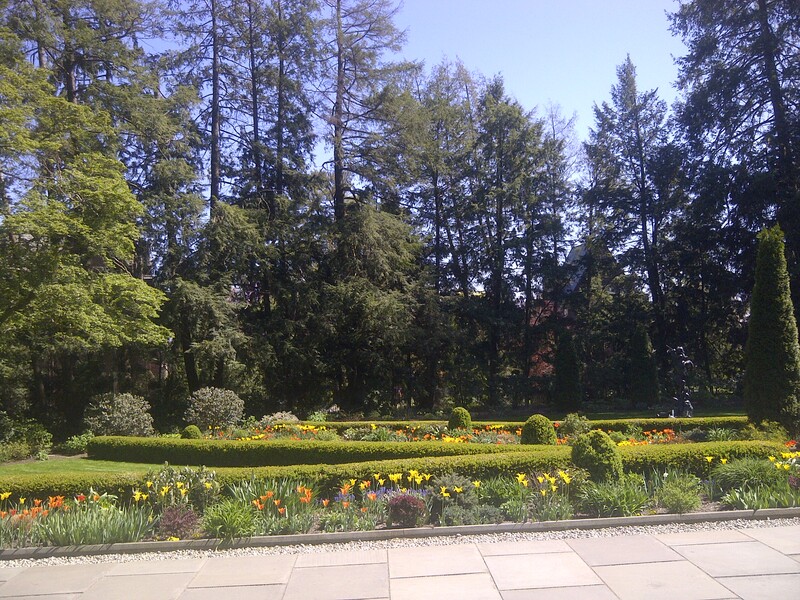 It would always be so beautiful outside, the sun shining and the perfect temperature for a PR. By junior year, I could not even imagine having the chance to run an entire spring season, and cool down from my last race thinking how it was time to take a rest before training again. That had not happened to me since 2007. Last weekend, I was finally given my chance. I could go on and on about what I did differently to get here, but I’m honestly not totally sure what that is. I took one day at a time. I maxed at 40 miles per week, and that was the week I did my 20-miler. 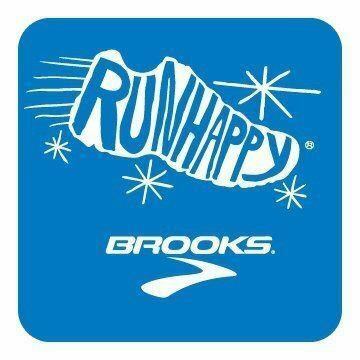 I only ran what I needed to run, and filled in the gaps with anything that would help me recover and stay healthy. 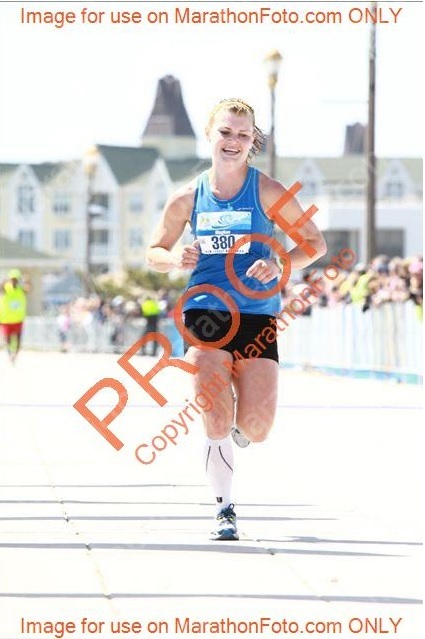 In the final half mile of the race, I couldn’t stop smiling (that is actually a smile in the photos…don’t question it). This was my victory lap, it was finally happening. I said what I wanted to do, and went out and did it. Most runners want the race to be shorter at this moment, I imagine. Just let it end. But I had a strange desire to make it last. 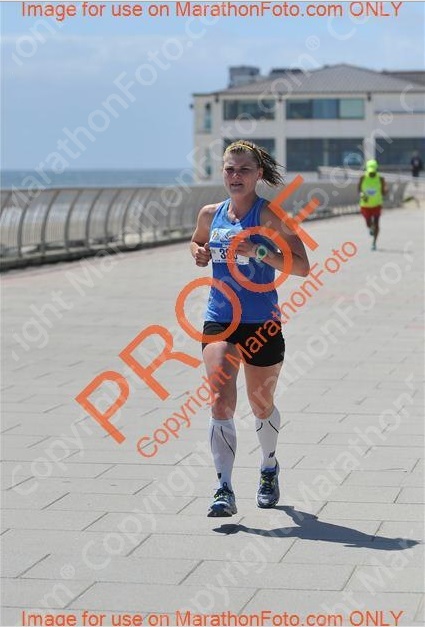 That did not deter me from bringing it in at sub-7 pace, of course, but I remember thinking about how grateful I was to be here, on this little brick walkway, approaching the finish line of the New Jersey Marathon. Finish lines have not been readily crossed by me, over the last four years. I could finally, finally, be excited about an accomplishment of my own. What’s more, I’m looking forward to doing it all again. So, I ran 3:25:02. At first, I was overjoyed. 3:25 was not even on my radar. * I thought I would run between 3:27 and 3:30. The ladies I ran with until Kate came along ran 3:27:45. I was told to “respect the distance,” and respect it I did. But…I felt pretty darn strong in the last 6.2 miles. I held back until mile 20. I honestly thought I would hit some wall at 21 and count on running miles significantly over eight minutes. It was only logical to think this would happen. But it didn’t. This is very good…but it leaves me thinking I was in shape to run faster. I know Brennan is very intrigued by McMillan’s running calculator. I decided to check it out, and my half marathon time, which I think I ran all-out for my first time, predicts I can run 3:16 and change. Now, that sounds a bit quick. Here is what I do know: 1. 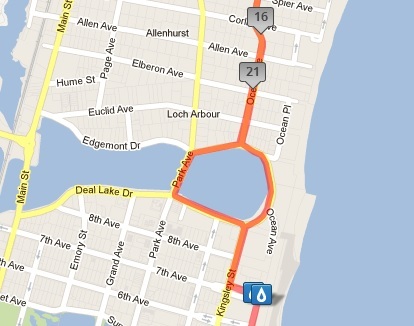 I ran 26.57 miles…I know this is normal, but my actual pace would give me 3:22:10 for 26.2 miles. 2. I could have ran every mile 3-5 seconds per mile faster and not bonked. Okay, I don’t know this for sure, but I have a pretty good sense for these things and given the way I felt the first 20 miles and the last 10k, this feels about right. So, next time, I shouldn’t be worried about starting out at 7:4x. That felt incredibly easy at mile 18. 3. I want to finish that way again. Now, I know if I go out faster I risk not feeling that good, but now that I know I can pick it up with 10k to go, I want to use this as experience and repeat it again, regardless of the pace difference. A goal for my next marathon, as of right now just because? 3:20:25 – averaging just under 7:40 per mile. I’d say that’s my B goal. But why am I saying all this now? I’m crazy. I think this is my favorite, going to buy it…or tell my mom to? – Having a pool & gym crisis…this might be resolved soon but for right now I really want to lift and swim and have been simultaneously kind of cheated out of the deal I was getting. Time to get sneaky, friends. Or innovative. Same thing? Sore subject here. – Running a little: three miles Thursday without a hitch, about six yesterday leaving me with a very tight left IT band…once I stopped running. I’m pretty concerned about this because I’ve been doing exercise to prevent this religiously for over a year, and when I had ITBS it felt similar to this and I was out 7 weeks. What did I do wrong? I’m trying to calm down and tell myself the marathon is over and I’ll be okay. – Choosing summer triathlons! I’d like to do three…a sprint, an Olympic, and…a half Ironman or just another Olympic if I don’t have the funds/I don;t get in enough biking or something. I’ve decided I can’t afford a new bike, so that’s that. Triathlon post coming shortly. I really just want to run another marathon, if you couldn’t tell by the goals I set for myself, like, the next day. 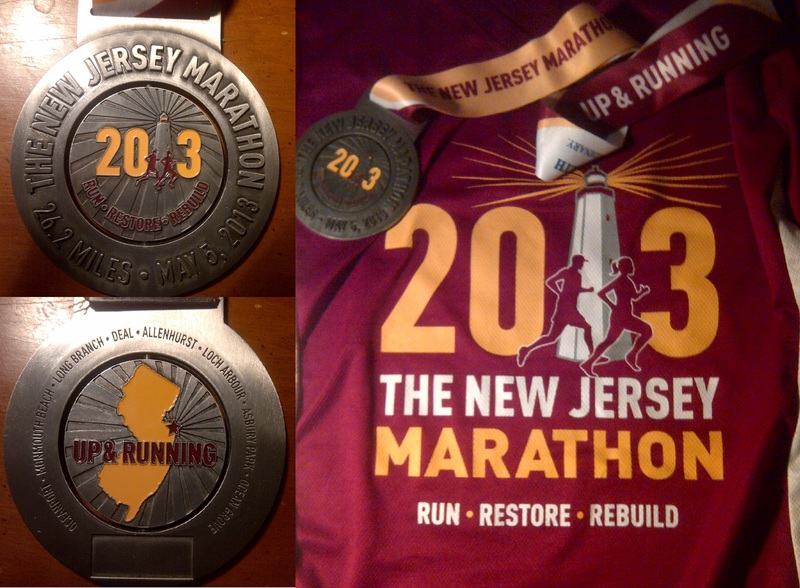 Thoughts on running three in a year span: NJ, Philly, Boston? Too much? If I do a fall marathon it will definitely be Philadelphia, that’s not a tough decision. Have you ever had a dream in which you are running your first marathon, and you’re getting towards the end when it should start feeling rough…when you realize you actually feel great? Then, you pick up the pace and still feel great, and you fly in towards the finish line, crush your goals, and feel on top of the world? 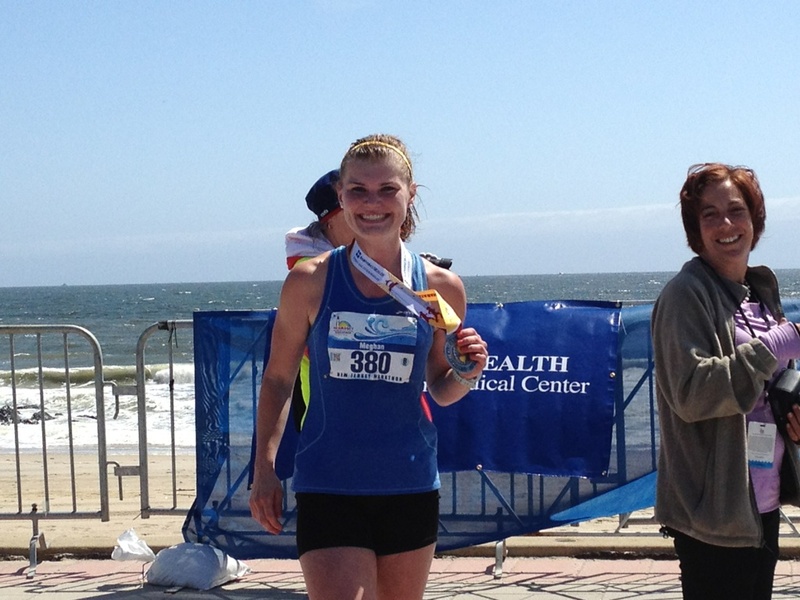 This is the story of when that dream happened to me in real life, at the New Jersey Marathon on Sunday. Pop some Nuun and take a bathroom break, this might will be a lengthy one. I slept well the night before the race. Mainly because sleeping is one of my favorite things and I am pretty good at it. Anyway, Brennan was picking me up at 5:30 AM, so I had my alarm my three alarms set for 4:30-4:45 (call me paranoid but I do this daily…refer to sleeping comment). I had a little oatmeal. My stomach was feeling a little off; I wasn’t hungry when I woke up and I would have preferred to be, just to avoid the chances of feeling full or bloated. So, I think I only had a few bites. Before all my long runs in training, I’d had just one or two gels for “breakfast,” but I wanted more in me before the marathon, so I thought my old go-to, oatmeal, was a good choice. Martin was riding with us, so he met us at my house, and we were on our way at 5:30. I was so glad Brennan was driving me, not just so I didn’t have to drive back, but so I could stay motivated and excited by my biggest fan. 🙂 The three of us chatted all the way to the shore, and “nervous” was not a feeling that ran through me at all. No quickened heart rate, no sweating, no panicking. I had the unfamiliar sensation that all I needed I would find out there on the course right within me. That was ridiculously corny and deep, but it’s the only way to describe it. How’s this for pre-race style? it was okay, and they said sure. Ingenious. Iscored a Johns Hopkins sweatshirt and Old Navy sweatpants, and Martin snagged a Delta sweatshirt and a big blue blanket with “Happy Holidays 2003” embroidered in the corner. They were perfect, and very warm and cozy. We checked our bags, and were a step closer to getting this thing started! The fact that we could go into the corrals now without a care made me relieved and excited. We weaved our way through people into Corral B. Martin headed farther up in search of the 3:15 pacer, and I found fellow Running Company employee Alex introducing himself to the 3:25 pacer. The guys holding the 3:30 flags were to my right, and the 3:25 guy was slightly behind me to my left. I was next to a group of women who looked around my age, maybe a little older. I ended up talking to the group of runners trying to stick with the 3:25 pacer, even though I had decided not to do that. I have a confession: I was really, really terrified of going out to fast. Everyone told me not to do it – there was no way I wasn’t listening to them. I get really caught up in races, really competitive, and really non-complacent when I’m not running as fast as I think I can. But, this was a marathon, uncharted territory. If experienced marathoners were all giving me this warning, I was going to listen. “So are you running with us?” one woman asked me. “Um…I think I want to start a little behind, I want to not go out too fast so I want to see an eight on my watch the first few miles,” I said. “Then we’re going to go too fast, you should go back.” I explained to her that the 3:30 pacer was currently in front of the 3:25 pacer, so I was just going to start right here. All of this happened before 8:00 AM, mind you. Things sorted themselves out. “Sweet Caroline” played before the start. It may have had something to do with Boston? I’m not sure. We were encouraged to sing the chorus. Then the race began. We shuffled out feet with our fingers hovered on our watches’ “start” buttons for a moment until we crossed the starting line. There was a series of beeps and then we were off! I was able to settle into a normal pace immediately, and I realized I wouldn’t be running this marathon alone; I was with so many runners! I just had to keep it that way the whole time. When I crossed the starting line and the marathon officially began, the strangest thing happened. I almost cried. This was really happening. After all this time, I was here starting my first marathon. And I felt great. I held back the emotions, telling myself to save them for the end when I needed motivation. The first five or so miles were on residential streets. Some families had set up camp in their driveways, playing music, cheering, and holding signs. Some people were even playing instruments! We fist-pumped and smiled at them, and cheered back! These miles flew by and felt ridiculously effortless. I was holding back the entire time and keeping my pace in check. There was a bridge before mile 6, which was one of the only uphills on the course. It was super short though, and made no difference in my pace. Getting a glimpse of the water was nice. I had been chatting with an older guy for a couple miles, hovering just ahead of the 3:30 pace group, but lost him soon after a water stop. I had an important decision to make when I realized a girl wearing annoyingly loud headphones was running exactly the pace I wanted to run…at first I hung back, but then I passed her…not sure when. I also plotted an escape from a guy with a continuously beeping Garmin. Miles 1-6: 7:52, 7:46, 7:56, 7:50, 7:37, 7:44. 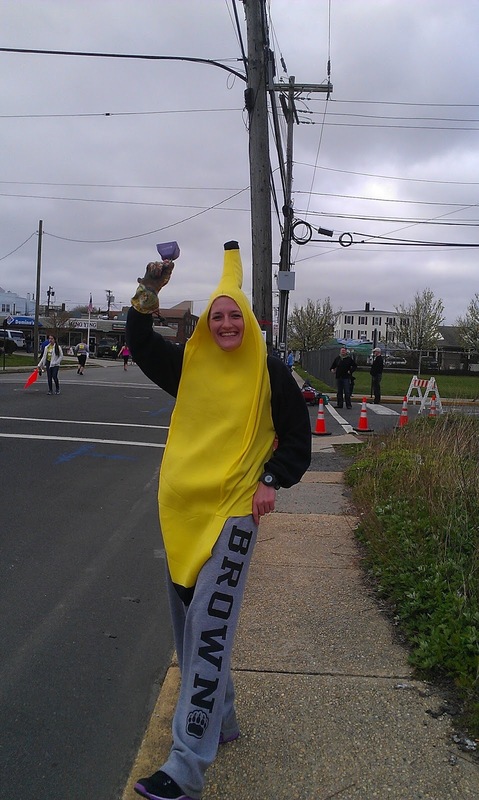 Brennan in all her banana glory (taken from her blog). 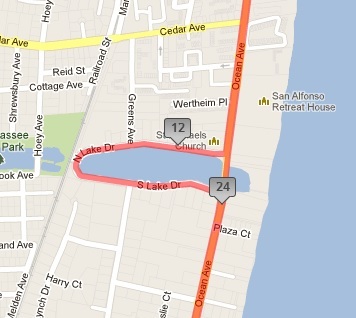 Before the half marathon mark, we went around this little pond thing (see map). When we were running on the far side, two things happened. We picked up two more runners for our little group, a guy, and a girl who looked like she was pushing hard. She was doing well, obviously, but I made it a point to always stay feeling more relaxed than she looked. At the time, I was still feeling comfortable. 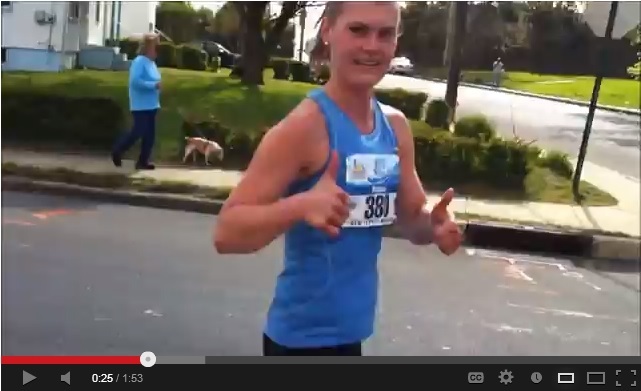 It wasn’t time, mentally, for me to be uncomfortable, at mile 12. The other thing that happened was I saw the big 3:30 pace group all the way across the lake, entering the loop as we were on our way out. Behind me. I went over to the right to cross over the half marathon timing mat, but apparently the timing system didn’t pick up my time! This is kind of annoying, because the people tracking me were concerned until 30k, and I’d really like to know what it was. 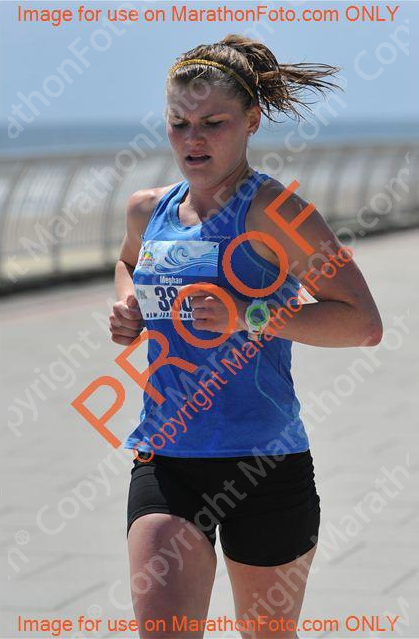 My watch was beeping about 0.2-0.3 before the actual mile markers at this point. I realized that I crossed the mat within a second of Lauren and Gretchen, so I just looked up their official 13.1 splits…both 1:43:50. 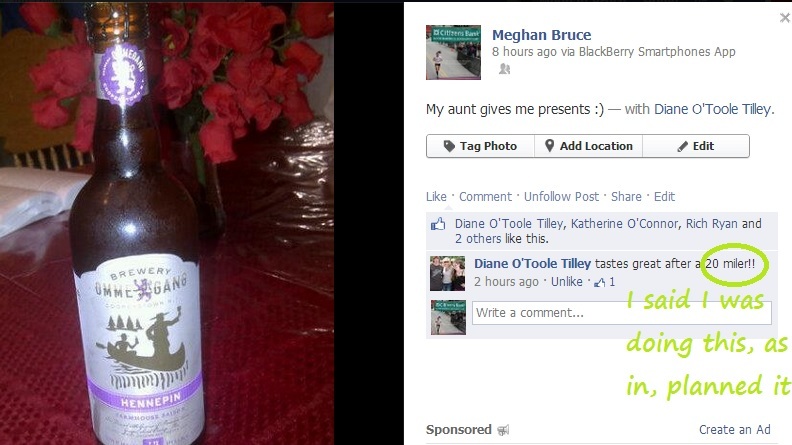 So, I’m going to claim that as mine too if that’s alright. I can’t imagine running alone down this straight stretch of road. The sun finally felt like it was beating on us, and the wind was intermittently blowing…but I hardly noticed, keeping in a rhythm with everyone else. Little body of water 1. Then came two other weird little bodies of water to run around. The lead men were passing us on the other side of the road as we approached the first, and somewhere in there I saw Brian (he ended up finishing 18th)! I cheered for him and he gave me two thumbs up. 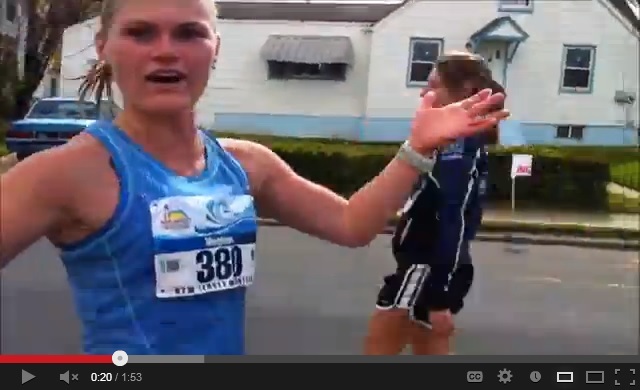 Apparently that’s a runner’s instinct while running, as is further suggested by my video screenshots. Little body of water 2. 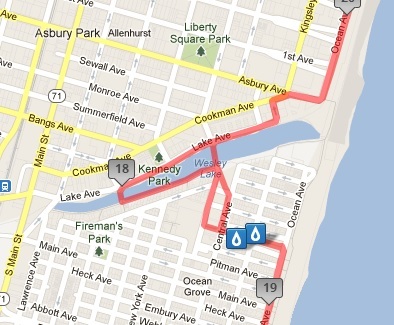 There was an out-and-back to the turnaround in Asbury Park (or Ocean Grove? ), during which we had a flurry of crowd support, which was nice! I was still smiling. After little body of water #1, my right hip started to tighten a bit. It felt like my ITB, possibly. It made me want to massage right over the bone, and do pigeon pose. I did the first as best I could while running, but obviously not the second. It never hurt or caused me to slow down though. Ironically, this happened right after I made the announcement to my little running group: “The last time I saw the ocean was when I had a stress fracture in my hip, and was sad, so I came to the shore alone for the day. I’m glad I’m seeing it again now like this!” For a second I thought I jinxed myself, then quickly reminded myself how stupid that was and got over it. The water stop just before coming back to body of water #2 on the way in was a game changer. Not because of water, or Gatorade, or Gu, but because KATE was there! I was so surprised to see her there waiting to run along with me, because she was supposed to run 7:15 pace with Martin for miles 13-23. It turned out that he was off pace at mile 13, so after running with him for awhile, she returned to this spot to run with me. The little bodies of water on the map are throwing me off a bit, but I think that was where I met Kate. I took my last Gu around there, making a total of three, exactly as I expected. She started mentioning “pretending I didn’t run 20 miles and making it a 10k tempo” once we reached 20. I was scared to death of this idea. Was that normal? Is that what people do? Is that what Kate does and her secret to 3:11 marathons?! I wasn’t sure what to do. I assessed the situation: The 7:45ish pace felt good, I’d been holding it for awhile and still felt like I was holding back. My stomach…had not felt good since mile seven, but I wasn’t sure if running faster would have any effect on it. It just felt a little too early to start dropping the pace. I wasn’t sure what would happen. I didn’t want to go crazy and then all of a sudden hit the wall. This was new territory, from 20 miles on….I gradually accepted this idea that I could stand to go a little faster if I was feeling this good. And so it began. We chatted about random things to pass the miles away, and Kate did a really good job of convincing me that I would be okay and I shouldn’t stop at a porta potty before the one that would be waiting after the finish. 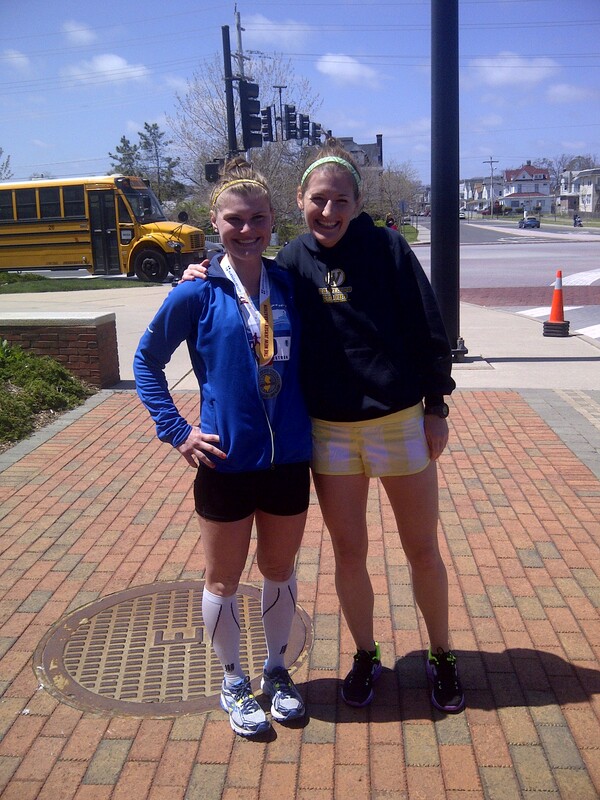 We saw Anne cheering somewhere along the 23rd mile, and it made me really happy to see her look so happy to see me! At around 24.5 there was a right turn, which put me on the road closest to where the boardwalk used to be (or maybe it was a temporary paved boardwalk?). As soon as I made the turn I felt okay with pushing even more. Glancing at my watch, I saw I was now running 7:20s. Kate let me go on alone then, and pretty soon I was approaching Brennan the banana and Amy again! They seemed to not expect me coming, as they weren’t looking in my direction and I took them by surprised when I waved at them. Brennan jumped right in and started running next to me. Video interview Part Two happened…and apparently the first thing I said to her was an expression of my fear involving my current porta potty desires. You can watch the video to experience this firsthand (secondhand? ), I wouldn’t want to spoil it for you. I was still having fun and smiling! Brennan asked, “you’re running kind of fast now, aren’t you?” It was true, about thirty seconds per mile faster than the last time she saw me! 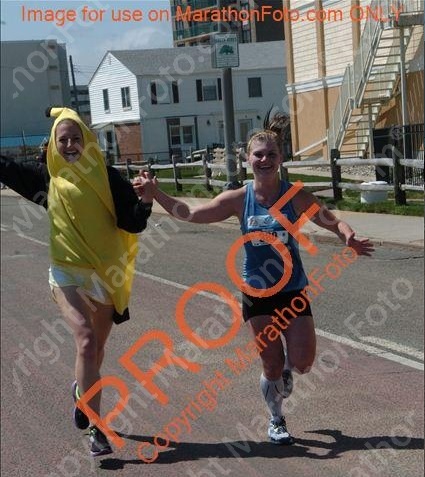 She stayed with me for almost a mile, and got lots of hoots and hollers for her banana suit! She also yelled lots of things about mermaids and told me the story of her haircut the other day. It was seriously exactly what I needed at that moment. Anything to keep me strong enough to distract me from the fact that my watch was approaching 26.2 far quicker than the finish line was appearing in sight! Basically, I didn’t want to think it was closer than it was, which at this point was significant after apparently not running tangents well enough. If that makes sense. Brennan dropped off to the side, and I was now running on a wide, brick path, which I recognized was definitely where the finish line was! The crowd was off to the left and the ocean to my right, and no one seemed to be running around me. I finally saw the big yellow finish and ran as fast as I could with a huge smile on my face. I heard Brian yelling my name really loudly, and then heard and saw my family finally. I crossed the line, got my medal and water, almost puked, and started walking at last. 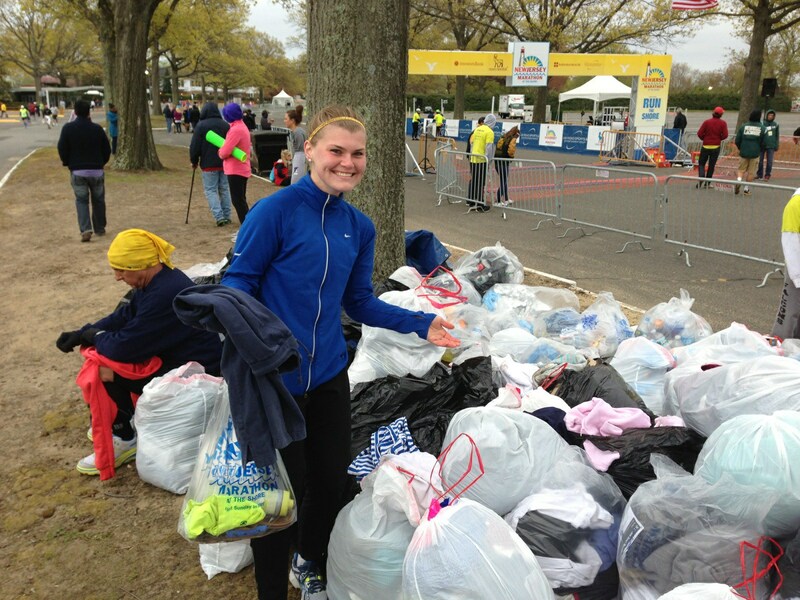 My family took some pictures of me immediately after I finished, and I think the look on my face says it all. Miles 25, 26, 0.57 (grr): 7:23, 7:19, 3:55 (6:53 pace) I ran 3:25:02, qualified for Boston by almost ten minutes, never once felt bad, and negative-splitted the race (1:43:50 + 1:41:12) as if I planned it that way. This moment could not have felt better. I want to reflect on the race much more in a separate post, as this one with “just” the race details is plenty long enough! There is so much more to write, contrary to what you might think. Here are a few more pictures…the running ones to come, since I don’t have any yet (people seemed to like to just take videos of me)! 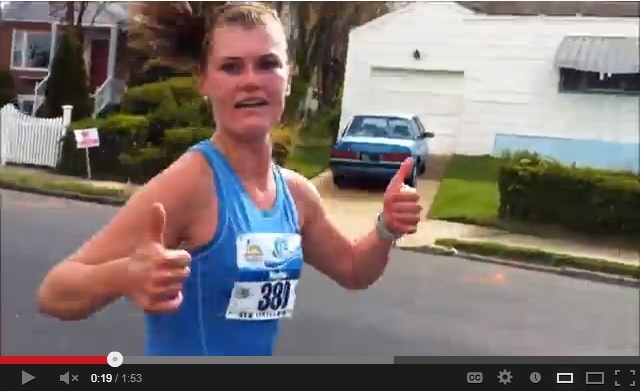 How to finish a marathon smiling. I want to stay here forever. Sleep here too. Second of all, remember how I said “I’m ready to taper”? Well, problem: I don’t know how. I don’t know what to do this week! Well, it’s not that bad. I think I have a plan now seeing as I only have FOUR DAYS left before the marathon!!! My original plan was do part of the PI workout Tuesday (done), take off Wednesday (done), cross-train or something Thursday, six miles Friday, off or walk around and stretch or something Saturday, race Sunday. This differs from my normal week in that I would have normally done the whole PI workout, cross-trained on all or most off days, lifted, and ran one more day. After consulting with some coworkers, I might shorten the six miles and run about four Thursday also, or three Saturday. 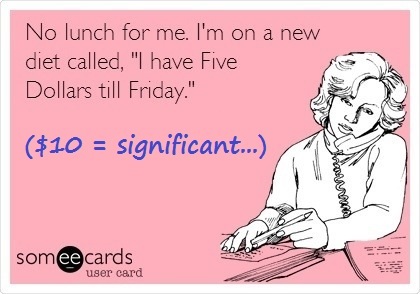 Or not shorten the six and still do that. Maybe two Saturday. What should I do? Please advise. Keep in mind that I usually run every other day, my legs felt very not rested yesterday, and I raced a mile last weekend so I did extra mileage Saturday and then ten on Sunday. Honestly, I think I will be fine whatever I choose, but I’m trying to pick whatever will avoid stiffness/tightness in my muscles on race day. I want to be ready to go. 2.) I did my 20 miler on three hours of sleep, inadequate hydration, no dinner, no breakfast, a high-heel wound, hills, and my “time of the month.” Enough said. I hardly bonked. I just “got thirsty.” I’m pretty sure I’ve got this. 3.) I did my 18 miler (okay, 17.8!) in 77 degree, humid, and sunny weather, all by myself. Now, this was not the most mentally easy long run, but I got through it, and add crowds and hundreds of people to run with…I’ve got this. 4.) I’ve done a speed workout every single week besides post-half marathon since the second week of January. Even if my goal pace right now is a lot slower than all those miles I put in, and the race has no hills, there has got to be something stored in me now that will keep me rolling at a decent pace even when it gets rough. 5.) Any pain I feel during this race is not going to be worse than the pain, physically and emotionally, I felt during nine stress fractures, IT band syndrome, an iron deficiency, and numerous other times when parts of my body just didn’t feel right. There’s no way. The course! I haven’t looked at it very closely…can’t decide if this is good or bad. 6.) 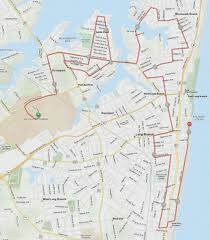 When/if I am looking up the straight stretch of beachside road the second half of the race, and mentally fighting with myself to keep going, I’ll remember all the other times I kept going: coming back from all those injuries when running a mile was a glorious victory but followed by a sense of “will I ever get to five again? Seven? Ten?” When I finished every other race in my life I had doubts about in the middle. When I was in the library in college for five, seven, ten straight hours without food or breaks, just hammering through what I needed to do. When I almost gave up trying to find my aunt in Boston, exhausted and overwhelmed, but kept trying to find a way to communicate with her until we were in the car leaving the city. Every interval workout I thought I wouldn’t finish but easily did once I got past that mental barrier. When I cowbelled until I blistered for my running buddies who will swap roles with me for this race! I’ve got this. 7.) So many other people run marathons. I’ve been running and racing since I was fifteen. 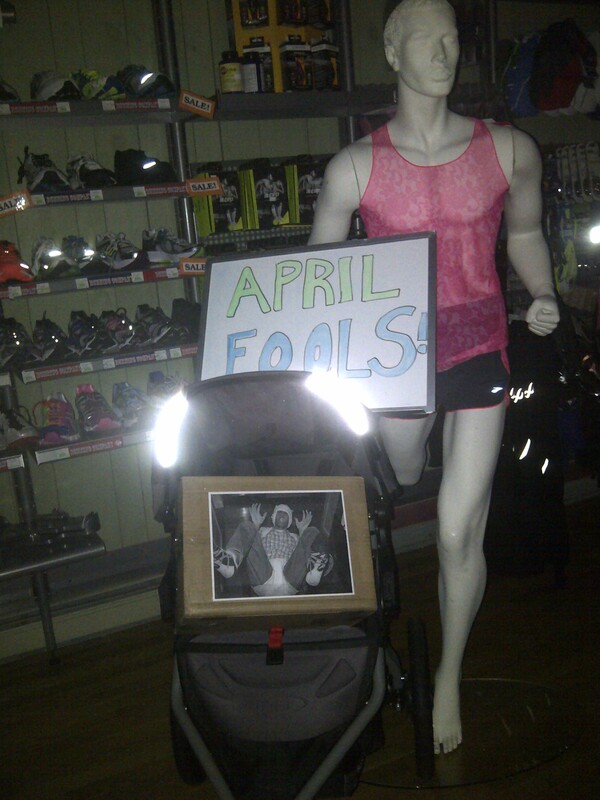 I work at a running store. I have a ridiculous amount of resources and I’ve used them all. To say I don’t know what I’m doing, even if it’s my first time, would be ridiculous. 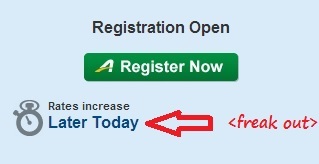 I know what to expect more than most people on that course, I would assume. I’ve got this. 8.) So many people doubted I could get here. I’m not doing this for them, I’m doing this for me, and I hope that it is just the first of many. But honestly, who doesn’t want the chance to say “told you so” merely in the form of a race result and finisher medal? That is the stuff I like. I’m a little dramatic sometimes. 9.) I’m concerned with things like, should I wear a visor or have Brennan give it to me later if I need it at the end because of the sun? Should I wear a shirt or just a sports bra? Should I carry one Gu or two? Instead of things like, Will my hip hold out? Will my foot start hurting? this in itself is a miracle, and honestly, the fact that I’m not concerned about how my body will hold up takes all the “bad fear” out of the equation and leaves just the “good fear.” That is, excited racing nerves I can’t get enough of. 10.) 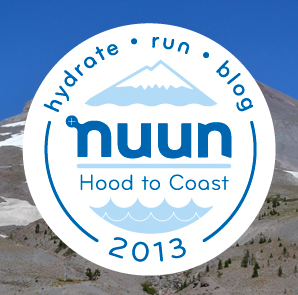 I’ve surpassed every goal I’ve set for myself this year (even if the goal was set mid-race…). That’s all. Edit: I might as well write my goals here too. C: Just finish it and not crawl. Though if you know me I’m just writing this as an obligatory first-marathon C goal, and this is not actually something I would be all that happy about. But you never know. I’d like to finish strong. My secret plan is now a reality. Why doubt myself now when I’ve come this far? 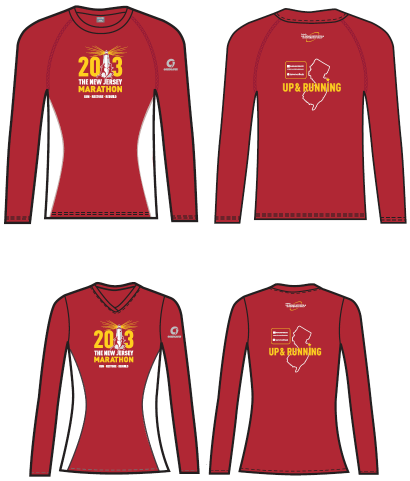 New Jersey Marathon in 5 weeks!